Protect your roof in Oakland Park with precast concrete scuppers poured in our factory off-site and delivered to your property for a flawless installation. 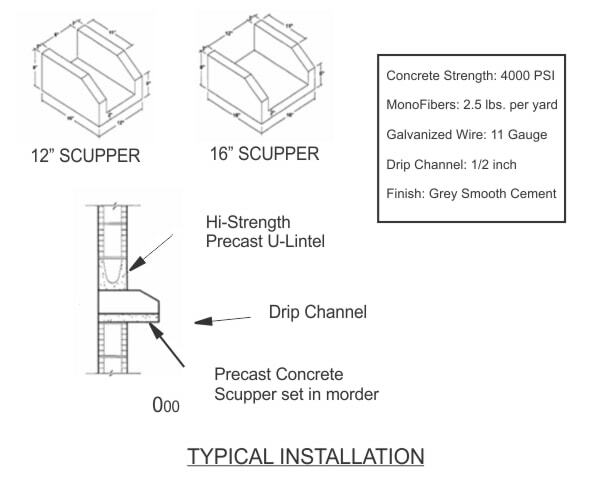 Since 1965, Atlantic Coast Precast has worked closely with designers, architects, engineers, and contractors among many other industry professionals to produce customized scuppers for cost-effective drainage on parapet walls, gravel stops, decks, and more. Call for your FREE quote. On a built-up or flat roof, ponding water may become a problem. Without anywhere to go, your ponding rainwater will begin to rot wood on your roof or deck, mold and mildew may begin to form, and you may end up with expensive structural damage to worry about. We can ensure proper placement and positioning for your Oakland Park precast concrete scuppers. Our team may even be able to create a matching downspout splash guard to redirect water. In Oakland Park, precast concrete scuppers will not become blocked with leaves and other debris, unlike other drainage solutions, instead allowing for this debris to be easily pushed through. Atlantic Coast Precast can offer a variety of sizes for your scuppers, from as small as 8 inches to larger 18 foot scuppers for industrial or commercial purposes. Get started today with your customizations or find out more about the perks of precast materials.